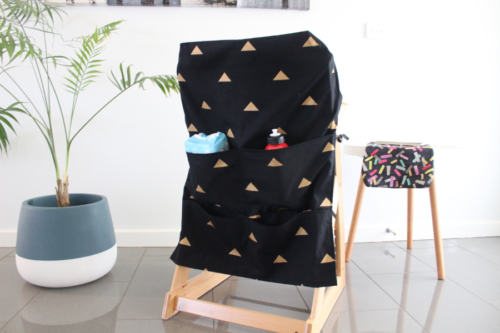 Our Large High Chair Caddy is essential for meal time with your baby or toddler. Stay on top of spills and tantrums with deep, wide pockets to stow wipes, spare cutlery, cups, bibs and more. Like an extra pair of hands when you need it most, our Large High Chair Caddy makes meal times simple and quick. With room to store all the bits and pieces you need for easy feeding, you don’t need to get up and down for wipes and a new spoon every 10 seconds. Keep your squats for the gym! The Large High Chair Caddy easily slips over the back of the high chair and ties to the legs for extra support. It fits over most dining chairs, so when your bub moves on to a booster seat or you visit grandma, your meal time toolkit is transportable. 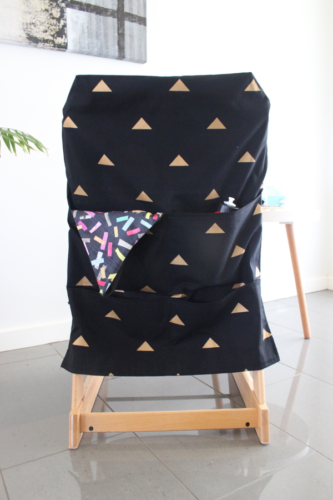 Handmade in this stunning black and gold printed fabric, our Large High Chair Caddy has a timeless look to complement any décor. To fit large high chair with a back no wider than 55cm wide. Overhang to fit over back of chair is 22cm deep.